It’s getting closer to my time of the year now – the fall season! Even after living in this area all of my life, I don’t tolerate the heat (and bugs) very well. So I love that feeling when the temperatures “finally” start backing down into the low-mid 70’s by day, and low 50’s at night. That’s when I start thinking about going to fall festivals, eating barbeque and being able to spend more time outdoors doing the things I love. Photographic Notes: Nikon D90 with 70-300 mm VR f/4.5-5.6 mm lens. All images © Matt Bennett Photography. 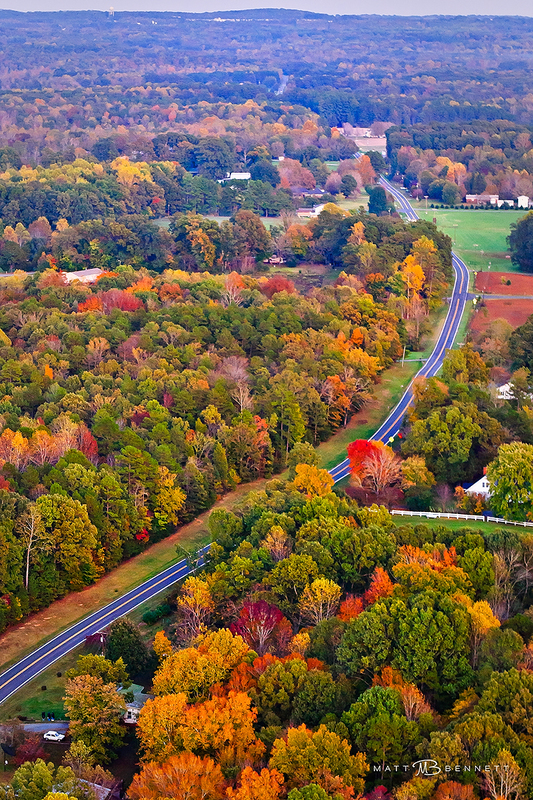 This entry was posted in Aerial Photography, Fall foliage, Randolph County by Matt Bennett. Bookmark the permalink. An ultralight? You’re a braver person than I.
Amazing photo. The morning light now is starting to make me think of fall. I have to admit Karen, I had serious reservations the first time I went up. Once we got up there and going though, I was fine. Now I’m hooked! Not only am I impressed by the gorgeous picture but the fact that you took them from an ultra-lite..wow!! So enjoy these “home town” photos!! It is so great to be able to identify and feel part of a picture!!! As always..incredible! I enjoyed viewing you blog and those beautiful photos. You may remember me from the Uwharrie Trail Club. Joe White from Pleasant Garden. I too love photography. I have several Uwharrie photos posted on my flickr account. I too am looking forward to Fall and heading down to Birkhead. Hey Joe, yes I do and it’s been quite a while since we last spoke. Thanks for following my blog, and appreciate the kudos! I hiked up on Dark Mtn Sunday afternoon. Weather right now is really nice! Hunting season is upon us now, so that kinda puts a different twist on things! Ii was excited to see the old Model T frame, because the trail was rerouted after a huge ice storm some time around 1998-1999. After thay I did not give it much thought, then that weekend, I decided to camp down by Wood Run on the old trail section, and walked around a bit, ant there it was. About a mile or so from the 24/27 trail head you will cross a bridge over Wood Run, take a left and hike along the creek about 1/4 mile. The frame will be on your left, and you will intersect witht the rerouted section of UT about another 300 feet ahead. By the way, thanks for viewing my photostream.